Want to get your hands on your own red scarf while also supporting ACCKWA? They’ll be available for silent auction at our World AIDS Day Vigil, Saturday December 1st from 3-5pm at Kitchener City Hall in the Rotunda. You are invited to attend, and we look forward to seeing you there! We are excited to embark on the Red Scarf Project for our second year. The Red Scarf Project, an awareness-raising and stigma-busting initiative in support of people living with HIV in Waterloo Region. 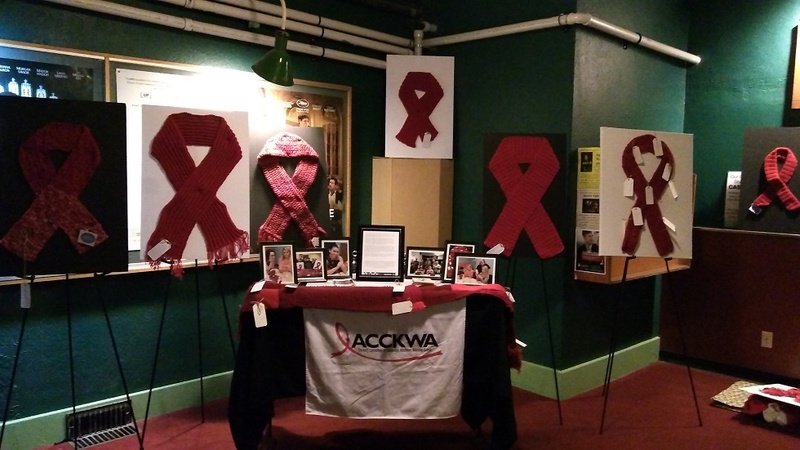 We hope to collect red scarves created by service users, volunteers, and community groups, along with their personalized messages expressing what their relationship with HIV and what ACCKWA means to them. These scarves and messages will then be displayed around the region throughout November and December, demonstrating to the community the many different ways HIV can impact someone’s life, regardless of their status. For the Red Scarf Project, the process is just as important as the end product. We will be bringing people together for “knit-ins” at our offices and in the community to share company and educate participant crafters about HIV in our region. Isolation is a consequence of HIV-related stigma, and we are confident that this project will bring our service users together with members of the community, to connect with new people and learn about the real, lived experiences of people living with HIV. Our project hopes to collect at least 50 scarves. Once the project is completed in December, some of the scarves will be auctioned off to raise money for our food program, and others will be donated to our partners at St. John’s Kitchen. The Red Scarf Project at the Princess Cinema’s screening of BPM in 2017!